This Seattle-based department store has a little bit of everything, no matter the budget. Men’s, women’s, and children’s clothing and accessories departments have trend-focused clothing and classics, from casual to business attire. The downstairs is centered around an enormous women’s shoe department divided into three sections—designer collections (Louboutins), less expensive trendy footwear (Jessica Simpson), and mid-priced options (Uggs and Kors)—a men’s department, and beauty and accessories areas. The second and third floors are dedicated to women’s, teens, and children’s clothing, and everything from hot designer Jason Wu and True Religion Jeans to Ralph Lauren and Jones New York are represented. 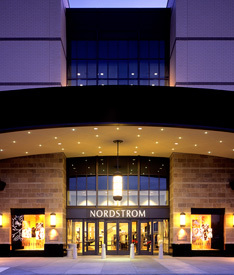 Both the Galleria and NorthPark Center locations have Spa Nordstrom within, and the NorthPark location has a Bistro N—a sophisticated option for lunch or dinner—on the third level.